Eight players participated in an invitation only event at CCFC this past weekend. Among them were seven masters including CCFC instructors Andrew Ryba, Ryan Young, as well as club co-founder and former scholastic director Daniel Lowinger. The format of the tournament with four rounds of G/75 spread over two days combined with eight players all very close together in rating guaranteed exciting and fighting chess. 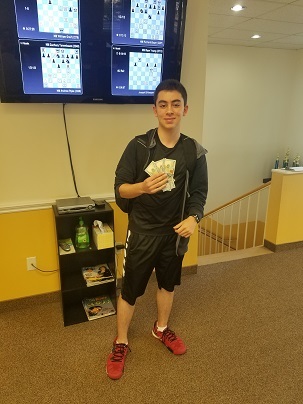 After just two rounds, FM Nelson Castaneda and NM William Graif were the only two undefeated players and were leading the tournament by a full point! Each of them maintained their lead after playing each other to a draw in round three. However, this draw allowed NM Daniel Lowinger to close the gap. 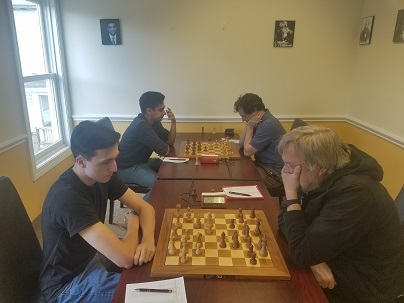 The top two boards of the final round were NM William Graif (2.5) vs. NM Daniel Lowinger (2.0) and FM Nelson Castaneda (2.5) vs. FM Richard Bauer (1.5). Castaneda v. Bauer was a short draw giving the winner of the top board the opportunity to tie for first or win the tournament outright. Graif sacrificed a pawn in the opening to create threats against Lowinger's king. Despite a heroic defensive effort, Lowinger was not able to withstand the unrelenting pressure from White's pieces. Congratulations to William Graif on winning this tough event in clear first with a fine performance!